Sgt Michael Sainsbury—539946 Sainsbury RMJ and known as Mike—was born in Chirton, a village east of Devizes in Wiltshire. The son of a farmer, he had a short spell in the Merchant Navy before joining the RAF not long before the war. A Metal Rigger with 211 squadron in Egypt, the Western Desert, Greece, Crete, Palestine and the Far East during Wolrd War II, Mike died a few years ago. Although Mike Sainsbury didn't talk about his part in the war much, he did leave a photograph album, carefully ordered, titled and including a list of his posting dates and places. Mike’s son Roger contacted me in late 2003 having had a look over the 211 Squadron story on-site. Roger has most kindly scanned most of his father’s photograph album and other memorabilia to share here. Among Sgt Sainsbury’s quietly treasured bits and pieces are to be found some cuttings from that rare bird, the BAFG Bulletin, mentioned by Wisdom and others. The cuttings, preserved in a little handmade plastic folder, are from Issue 25 of 3 January 1941. 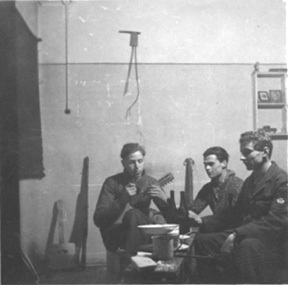 They record a 211 raid on Elbasan in Northern Albania and report on the success of a Services concert at the Rex Theatre on the evening of 2 January 1941. Attended by HM George the King of Greece, Prime Minister Metaxas, and AVM D’Albiac, the talented cast from British Air Forces Greece included one LAC Sainsbury, baritone. One of the early starters in 211 Squadron, by great good fortune Sainsbury survived the gamut of ME and FE operations up to 1942, to become one of the early home-comers in August 1943. 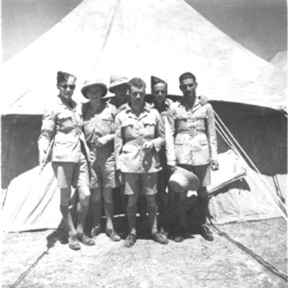 Arriving in the Middle East via Malta on 29 April 1939, he was in Egypt by May and at Dabaa from 10 August 1939. Ranked LAC as early as January 1941 if not before, he was in Greece by 6 November (apparently as part of an advance party arriving 10 days before the Air Party); in Palestine by 29 April; in the Air Party to the Far East arriving Palembang (P1, Sumatra) on 4 February; arriving at Tjilatjap (Java) on 26 February. Evacuated from the port by sea soon afterwards, his manuscript summary itinerary records arriving at Colombo in Ceylon on 6 March 1942: making him almost certainly one of the large number of servicemen fortunate to be aboard the Kota Gede (18 or more of them from 211 Squadron). Consistently early in arrival at various postings, he apparently took part in at least two Air Party movements, including that to the Far East: recognition of the importance to operations of an LAC Metal Rigger’s steadiness and skill. 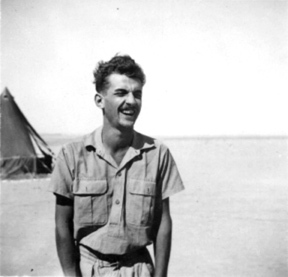 Arriving in Colombo, Mike spent over a year in various posts in Bombay or Karachi, before a brief sojourn in South Africa from May to July 1943, returning via Freetown (ie by sea) to Liverpool in August. While some of his dates are just 1 day earlier than other records, if this be a discrepancy at all, it need not distract attention from the main point: in his travels Sergeant Sainsbury was often an early bird. Selected by Roger and by me, from the collection of 5539946 Sainsbury RMJ Sgt. The captions in italics are taken from the album. The remainder of the commentary is mine. From his service dates, “Sains” very likely saw the Squadron converting to Blenheims. This splendid Mark I shot shows the flightline caught on a dull overcast day, with L1488 leading the group of six or perhaps seven aircraft. Displaying the white pre-war LJ unit code, the nearest ones are fully covered against sand and sun. A small scatter of gear lies about, including 4 gallon tins and perhaps a pair of tool boxes by the 2nd aircraft. Mike’s photograph is remarkably similar to Flight line-up in my father’s collection. In that shot, four aircraft are shown on a clear bright day with L1990 LJ-R nearest and under maintenance. To all appearances taken at the same place, the two were almost certainly taken on different occasions, at some date pre-War (from the LJ code) and between the conversion to Blenheims (April-June 1939) and September 1939 (when the UQ code applied). Reported at Tel Aviv “early in the war”. Sold twice at Lydda in Palestine 1940. CA expired 25 July 1940. Reduced to produce [components] November 1943 (Air Britain Archive Nov 2 1981). Quite a lot of Hawks were built in numerous versions, with varying engines including the DH inverted Gipsy line. 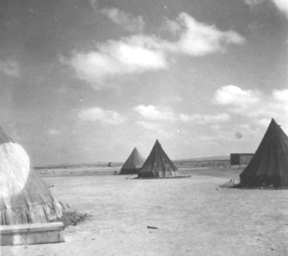 With few pictures of Aquir, Lydda and Ramleh to go on, this may be “somewhere in Palestine”—hard to be certain. And why then would RAF (presumably 211 Squadron) personnel be servicing a civilian aircraft, one wonders. The “reduced to produce” remark suggests impressment, but that remains unconfirmed. An enigmatic shot. The aircraft serial no is not visible, though the camouflage scheme seems to be the original European Dark Green/Dark Earth/Night Black. The horizon has disappeared - despite the nonchalant pose of the sola topee’d personnel, a sand storm may be approaching. 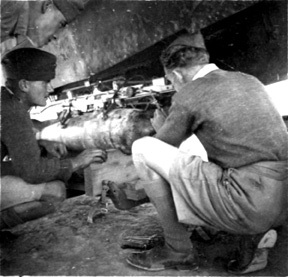 A Vickers Valentia transport at work “somewhere in the Middle East”. 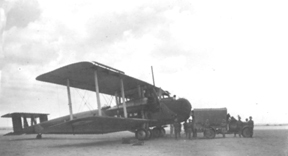 70 Squadron and 216 Squadron operated these distant relatives of the WWI Vickers Vimy until late 1940 and late 1941 respectively. This aircraft has the open dorsal gunner’s position above the cabin. 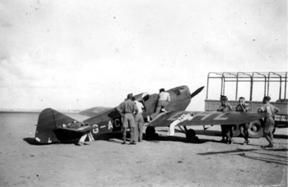 Six of 216’s aircraft were so modified at the time of the Abyssinia crisis in 1935/36. 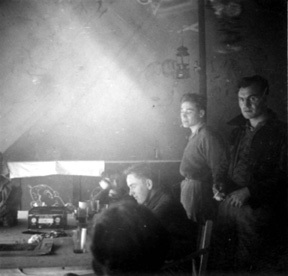 Not all Valentias had this “luxury” but the photographic record shows that both Squadrons had aircraft so equipped. The aircraft is camouflaged, which suggests a war-time date. The solemn presence of the personnel at attention along both sides of the covered MT hints at a grimmer purpose than the title suggests. 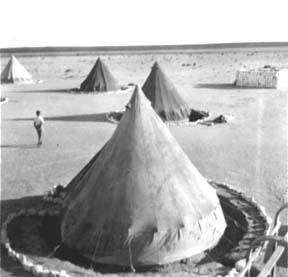 When the mobile squadrons first deployed to the new Western Desert landing grounds in early 1939, they were issued with tents of WWI vintage. Mercifully, after 20 years on the shelf they didn’t last long. These uncamouflaged bell tents may be of later issue. Very close to the flightline and no dispersals here. The mounds in the foreground are likely of more mundane origin than their ominous dimensions might suggest. At this date, whether for decoration or drainage or as a night aid, some Tidy Annie has arranged for white-washed stones around each sleeping quarters. Cramped is hardly the word. Furnishings courtesy of Shell. 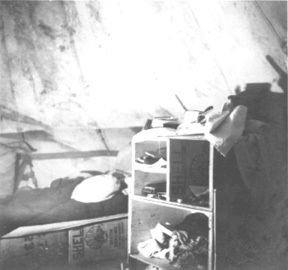 The standard of accommodation never did improve much for a mobile unit in the Middle East. 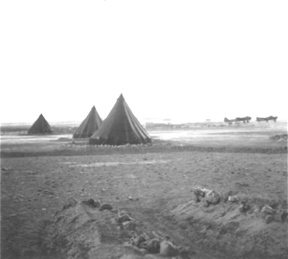 The bell tents were still being used in late 1940 (see CFR Clark Photographs, and JE Fryatt for example). Listening to the radio in the Mess tent. Christmas messages, perhaps. This is a good shot, for which the boys had to keep pretty still. Very evocative. Taken from the other side of the station at Dabaa, in the far background. A little nearer, an intact Blenheim and tent at dispersals. In the mid ground, three men are working among what may be the wreckage of the crash site. The crushed Blenheim L1486 of Collier and Thomas. They got away with it, just. Taken some time later, propped and chocked for the sake of spares cannibalising. “Soon after” photographs were held by a number of Squadron lads: Cooper, Grierson, Hoyes, Sharratt and Wingrove. This page shows the results of various accidents to 211 Squadron and other aircraft. Tin hats on. The inadvertent close encounter involving Blenheim I L1481 B-Beer of 211 Squadron and a Bristol Bombay of 216 Squadron. 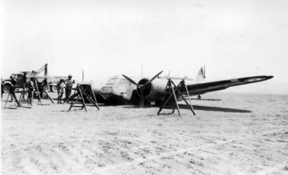 Variously reported as in May at Mersah Matruh, or July at Daba, this accident occurred in the pre- dawn of 12 June, part of a mass 45, 113 and 211 Squadron raid to arrive at dawn over Tobruk. Also shown by Mick Dudman and Geoff Grierson. A damaged 45 Squadron machine that looks like a “spares" aircraft, in an either unfinished or partly derelict, unroofed Bessoneaux hangar. The unit’s OB code is just visible. 45 Squadron had Blenheim Is until February 1941 and spent periods at Dabaa, Quotaifiya and Fuka (as well as the well-equipped Helwan) in 1940. Dabaa and nearby Quotaifiya had very few servicing facilities. The portable Bessoneaux hangar was much used by the RAF from World War I and long after. Close inspection of the image shows the wooden frame and the canvas side-curtains of this portable French design, and a concrete floor. These units could be packed on pallets for transport and erected in the field, to provide hangarage of about 66 feet by 79 feet. This example, whether derelict, partly erected or partly disassembled, is a serious clue but for the moment, we must leave its location as “somewhere in the Western Desert”, just possibly Fuka. D-Don [! ], the unit code partly obscured but consistent with the OB of 45 Squadron. It seems to be repairable, protected by a 4 gallon tin blast wall and carefully covered. Other shots on Page 5 are even more wrecked, though whether that is from the crash or subsequent recovery who can say. 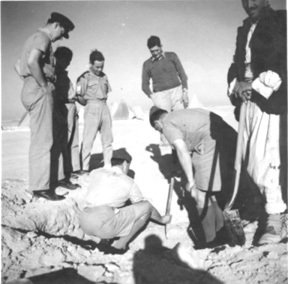 There is another blast pen shot on Mick Dudman's page: Mersah Matruh May 1940. Most likely a 250lb GP, still lying on the wooden chocks of a partly improvised bomb trolley. The bomb carrier has been lowered, the bomb’s mounting lug locked securely in the carrier’s slip-catch release, the jaws of the carrier’s adjustable steadies set firmly against the bomb casing. 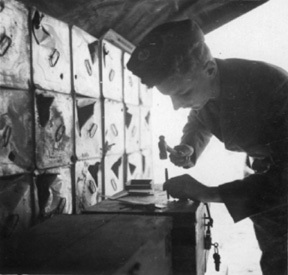 The Armourer is attending to the final arming of the nose pistol, attaching it to the carrier’s front fuzing box. Shortly, the completed (and “safe”) assembly will be winched up and secured in the bomb-bay. Then the whole process will be repeated until the bomb load is complete, perhaps another 250lb and two SBCs, a thousand pounds of ordinance in all. After 9 months of desert dirt-surface flying, the bungee-sprung doors already look somewhat second-hand. 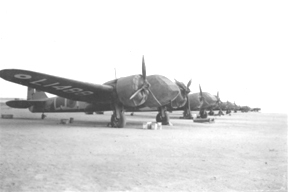 In the early morning light, at least five Blenheims at readiness on the flightline, with four figures in the distance. Beyond the last aircraft and just to its right, Dabaa station can be discerned. UQ can just be made out on the second of the four aircraft line-up. The mass take-off of the two Flights was captured by “Doc” Squire. The standard arrangement was to operate Flight by Flight, formating as vics of three aircraft. The sixth aircraft of this group is somewhere out of shot, although “short” formations were not unknown. 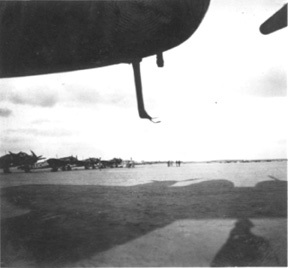 On the far side of the landing area, practically on the horizon line, stand the three aircraft of the remaining Flight. It was quite usual for one or two Flights to sortie, the remaining Flight/s held in reserve either for operational reasons (another raid, for example) or for maintenance. A three-Flight raid of 9 aircraft was “maximum effort” at this date. See also CFR Clark. 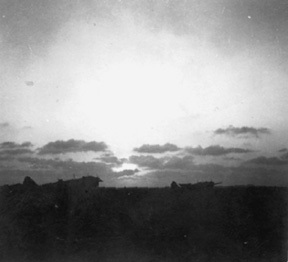 Leaving at dawn on 11 June 1940, the day Italy entered the war, 6 aircraft of 211 Squadron were among the first to attack the Italians in Libya. Their target was El Adem, photographing from Derna to Giarabub as they went. The Regia Aeronautica were initially taken by surprise, 33 Squadron Gladiators finding no trade. That morning, Blenheims of 45, 55 and 113 Squadrons also attacked El Adem in repeated sorties, for the loss of two aircraft and their crews, with three more damaged. Mike went to a lot of trouble with his photos, undaunted by difficult lighting. Tough times were coming and the Greeks knew it. 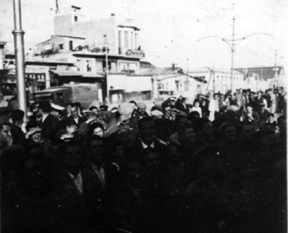 On arrival at Piraeus, the 211s were met by crowds mounting an impromptu welcome. Men of every Service never forgot the warmth of the people of Greece, in hope and in adversity. It was a long drive from Athens, northwards through the Pindus Mountains to Epirus. The street paving and power lines suggest this may be Paramythia, though there were other village stops along the way. Late afternoon light, perhaps. The village powerline takes nothing away from this beautifully lit shot. A number of Mike’s photos suggest that he was using filters to ensure good sky effects, and was unfazed by poor light. Apparently his camera took 2¼in square negs (ie quite generous) but for some reason the prints are not especially sharp. The pictures themselves of course are quite wonderful. A contemplative moment. These young men have already seen much. Mike Sainsbury on the right. 20 April 1941, very likely. He was in Crete by 21 April, and back at Alexandria a week later. Aboukir (Abu Kir), famous from Nelson’s day, was a flying-boat base close to Alexandria. The Sunderlands of 230 Squadron were often to be found here. Mike Sainsbury front and centre, hatless and looking serious. Are those Corporal’s stripes just visible? 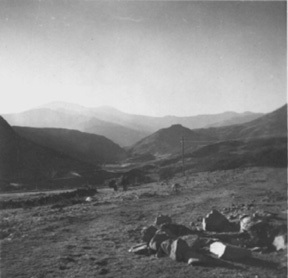 En route to the Far East, Mike took this shot on 29 January 1942 at Bahrein. The aircraft serial no is not in shot. The Sgt Pilot (R), Sgt Observer (middle) and jumpered WOp/AG are unnamed. A happy shot that belies what was to come, this photograph is a very rare treasure indeed. There are just four known shots of 211 Squadron aircraft of the first Far East campaign. The other three are shown on the Blenheim Mark IV page. Who are these men? 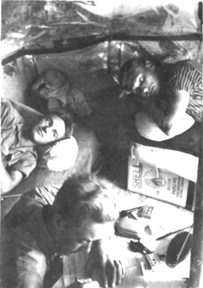 From Mike’s itinerary, John Keeping’s diary, Dru Paterson’s letter and the various photos at hand, it is possible to eliminate several possibilities: they seem not to be any of S/L Dundas’ 6 crews. Alas, there is not enough information to identify these men firmly. To suffer an all too usual fate: spot the “catch”! 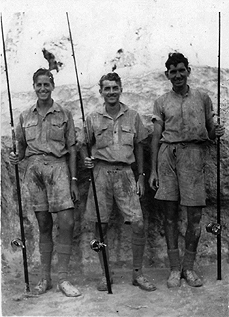 Three off-duty mates with gear but nil fish. No place or date on offer, nor rank badges. However, all three men appear as Corporal Metal Riggers on the movement order roll as they were plucked out of 72 OTU on posting back into the re-forming 211 Squadron in December 1941. Left to right, 539814 Montgomery JW, Sainsbury, and 539948 Rowlands BL (sic: Rowland). One of the highly skilled Group 1 trades at that time, by 1943 the Metal Riggers had been reclassified among the Fitters at that level, as Mike later described himself. 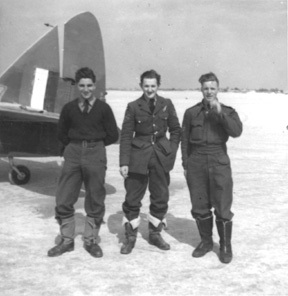 All three were with 211 Squadron for the move to Sumatra and Java in 1942. At the fall of Java, Montgomery suffered the misfortune of falling captive to the Japanese but survived. Rowland was with the last Squadron men evacuated aboard Tung Song for Australia. Sainsbury, ever prompt, had been evacuated a few days earlier, per Kota Gede, for Ceylon. Repatriated to the UK, by 1944 Rowland was a Sergeant and decided to apply for aircrew. His commission as Pilot Officer on probation wef from 17 April 1944 was gazetted on 6 February 1945. Sad to relate, by then Pilot Officer Bernard Lawrence Rowland 56272, Flight Engineer of 61 Squadron RAF, was already dead, killled in action on 3 August 1944 with five of his crewmates lost that day in Lancaster PA162 QR-L. They lie in Creil Communal Cemetery near the R Oise, some 25 miles North of Paris.